Synthetic Biology and Metabolic Engineering in Plants and Microbes, Part B, the latest volume in the Methods in Enzymology series, continues the legacy of this premier serial with quality chapters authored by leaders in the field. 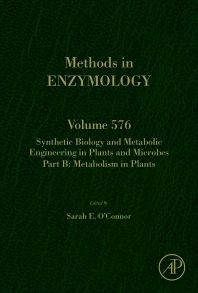 This volume covers research methods, synthetic biology, and metabolic engineering in plants and microbes, and includes sections on such topics as the usage of integrases in microbial engineering, biosynthesis, and engineering of tryptophan derived metabolites, regulation and discovery of fungal natural products, and elucidation and localization of plant pathways. Biochemists, biophysicists, molecular biologists, analytical chemists, and physiologists.